Please include all text and customizations for your order here. Include your GPS coordinates if applicable. This listing is for one necklace with two discs. Dainty 1.5mm ball chains have very small tube closures. Request a thicker 2.5mm if you prefer one that is sturdier and has a bigger tube closure. FOUR Words are included. Add additional stamping fees for more words. There is a link below. Dropdown menu states "Grande + Mini disc"
For example: "Silver + gold" means the Grande disc is Silver and the Mini disc is Gold. ★ During checkout, select which metal finishes you'd like per charm size (silver, copper or gold plates). 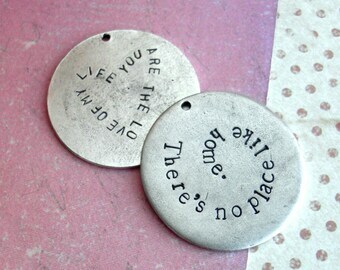 ★ Be specific on what you want stamped on both charms. You can reference font options in the Size Guide photo. If you're unsure, let me know that I can choose for you. 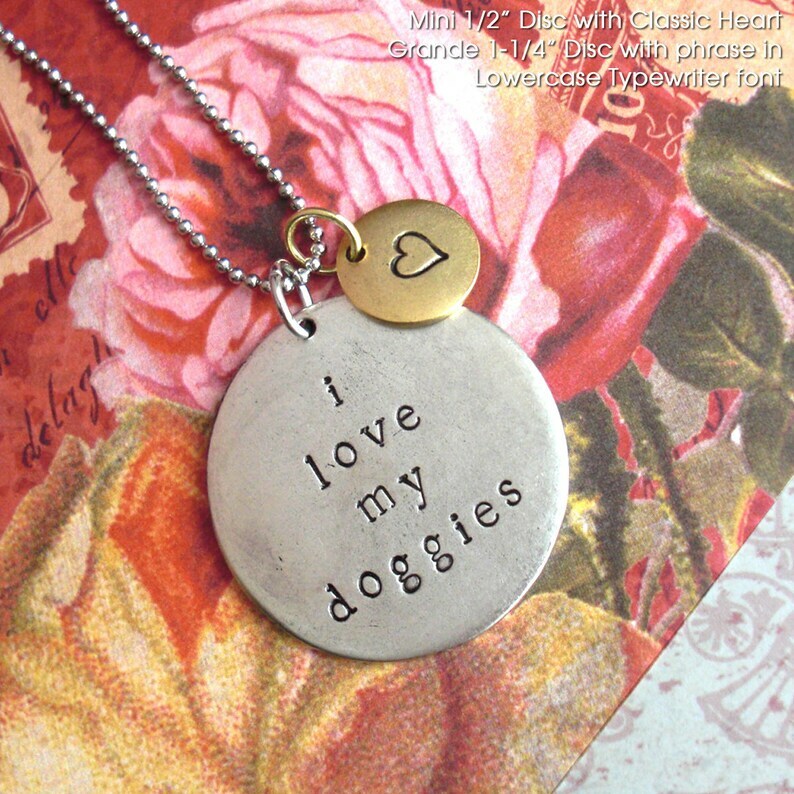 "i love my doggies" you can select a Dog Bone stamp or Tiny Paw Print for the mini disc. ★ Let me know which length you'd prefer, up to 24" is available for bead-ball chains. You can cut your chain shorter at home with regular scissors if preferred. If you don't tell me during checkout the length will vary. Dainty 1.5mm ball chains have a small tube closure; request a thicker 2.5mm one if you prefer one that is sturdier with a bigger tube closure. ★ You can request the Grande Rectangle tag in silver or Large washer genuine Copper instead, for the same price. ★ For the Grande Round Disc: All three metal finishes are available. Use the photos as a visual guide for sizes and lengths. The degree ° symbol will be as pictured based on the font size used. When in doubt, you can use the asterisk * in place of a degree, and I will still stamp the ° degree. ★More quantities can be custom ordered. 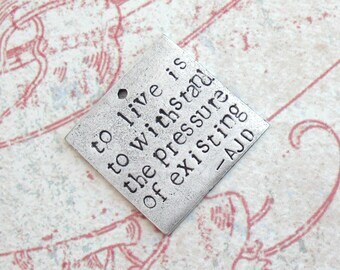 Add this charm to your own necklace, or order one through my "charms" section. Check out my Policies section if you'd like instructions on how to open and close a jump ring. ★Add a gift box for $1.50 ~ locate the listing in my "charms" section. Just click on "keep shopping" from your cart to add more items from my shop. PLEASE NOTE: As always, each charm is stamped by hand and may not be in perfect alignment; this simply adds to the hand-made nature of your unique charm. PLEASE NOTE: Your jewelry will look its best and last longer if you do not wear it in the water. Please visit my shop policies for more information. Just adorable and beautifully made! Whenever we adopt a new pet we get them a new tag and I order one of these cute charms. Then everyone knows who they belong to! But these are so versatile for any loved one or occasion and so pretty for every day. Payment on all purchases is due at the time of checkout. Please contact me immediately if you have questions or would like to use a different payment method. DISCOUNTS: If all the charms are the same: Orders of 10-19 charms will save 10%. Orders of 20+ charms will save 20%, and can take up to two weeks to complete. Convo me for a custom quote. Include all of the details of your order. Only one discount can be applied per order. QUANTITIES: If I have a charm listed as 1 available but you see more in my "charms" sections, click on "keep shopping" during checkout, then you can select more until you have as many as you need. You can buy any same-priced item as well to cover the cost. GO to www.paypal.me/tipsywhimsey and enter the dollar amount you need to send. Make sure you send me a conversation to let me know you've sent your extra payment. RUSH speeds up how quickly your small order gets stamped. Should be ready to ship the next business day. PRIORITY Shipping speeds up how quickly your small order gets shipped to you. Averages 2 business days in the U.S. after it is stamped and ready to ship. Priority includes insurance on your package. - 1 Gift Box Only: Regular First Class shipping, but includes 1 gift box. To add more gift boxes to your order, search for the Gift Box listing in shop & add to your cart. - 1 Gift Box + Rush + Priority Shipping: Includes 1 gift box, Rush stamping and Priority shipping. PRIORITY Shipping is through USPS (United States Postal Office). - International customers will have a couple different options for shipping upgrades. Why is there a shipping fee on each additional item, even for extra stamping? PLEASE NOTE: When you purchase multiple items the shipping will increase due to increased listing fees, service fees, package weight and/or supplies. All MN residents will need to pay sales tax with their order. I do my best to ensure that your item is special and new and perfect. Some handmade items have their own natural flaws, it is what makes them unique. You MUST add insurance to your shipping to receive compensation if the USPS loses or damages your package. Tipsy Whimsey is available in the studio Monday-Friday during regular business hours. Ann will reply to questions as soon as possible, but you may experience a delay over the weekend. Be sure to include all of your details (big and small) during your checkout notes, or in a separate email or Etsy conversation to Ann. Thanks! ALIGNMENT: For hand-stamped charms, please note that the alignment will not be perfect. I stamp every letter, number and character by hand. The metals I use will have their own inherent flaws, each one is unique and will vary from the photos you see. Please proof read your order notes before completing purchase; I do all of my stamping based on those order notes. You can write them up in the Comment Box during the checkout process. If you have trouble there please send me an Etsy Convo with the details. If you are making a change in the spelling, for example, please tell me that specifically in your follow-up notes. When in doubt I will stamp what you write in the comment box during checkout. I do not proof-read or spell-check or look-up the spelling, grammar or coordinates that you provide. WARRANTY: I offer free repair within 2 weeks of your purchase (chains are excluded); this does not include lost pieces, or broken beads. Each circumstance will be handled on an individual basis. Shipping will be paid by you. CHAINS need to be handled with care. They get caught on things, children pull at them; they get exposed to water, perfume and lotion which will degrade their quality. Be careful with the tube connector on your ball chain, they are small and are easy to detach. I will warranty your broken chain for 2 weeks from the date of purchase. Lost tube connectors and ball chains are not included in this warranty. Each circumstance will be handled on an individual basis. Shipping will be paid by you. YOUR ITEM IS CUSTOM MADE. 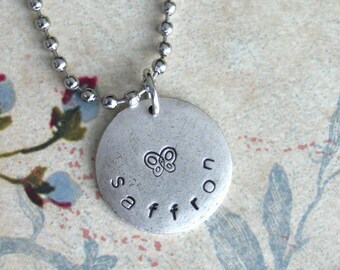 Remember when you order and purchase hand-stamped charms, it is being created just for you. It will vary from the photos. Please be sure that you are committed to your purchase and verbiage for stamping before sending payment. Once you send payment, your order is considered finalized. SHIPPING: I cannot be held responsible for shipping related issues once the package is received by the Post Office. Please contact the Post Office using your tracking # if you have questions about delivery. See USPS phone # above, in the Shipping Policy section. YOU MUST PURCHASE INSURANCE ON YOUR SHIPPING IN ORDER FOR THE POST OFFICE TO REIMBURSE YOU FOR LOST OR DAMAGED PACKAGES. CHANGES TO YOUR ORDER? : Once you have submitted payment your order is finalized. I'm happy to make changes to your stamping request BEFORE I have stamped. If I have stamped the charm(s) already you'll need to purchase a new charm or charms. If you want to cancel your order but it has been stamped already, but not yet shipped, then I can refund the cost of shipping only. Email me at Tipsy@Roguephotography.com or Etsy Convo me ASAP if you have changes. Thanks! REFUNDS ARE NOT OFFERED ON CUSTOM STAMPED PIECES. When a refund is applicable and approved: Shipping expenses are not included with refunds. You may be asked to ship the item back to me. You must provide a tracking # when shipping the item back to me. SORRY, NO POSTAL SUBSTITUTIONS. I understand that you may believe another option is better, or cheaper. I stick with USPS and padded shipping with tracking numbers as the best option for my business. - Rush + Priority Shipping: You get both Rush stamping and Priority shipping with this option. Averages 2 business days in the U.S. after it is stamped and ready to ship. In the U.S. this includes insurance on your package. - 1 Gift Box Only: Regular First Class shipping, but includes 1 gift box. To add more gift boxes to your order, search for the listing in shop & add to your cart. - 1 Gift Box + Rush + Priority Shipping: Includes insurance, 1 gift box, Rush stamping and Priority shipping. - Add Insurance (covers values up to $100). You MUST add insurance to your shipping to receive compensation if the USPS loses or damages your package. Generally I ship everything USPS First Class. They average 3-5 business days to deliver around the U.S. Your package is coming from Minnesota, USA. SORRY, NO POSTAL SUBSTITUTIONS. I understand that you may believe another option is better, or cheaper. I stick with USPS and padded shipping with tracking numbers as the best option for my business. Add insurance to your package during checkout - shipping options to have your order covered if the USPS damages it, etc. I can't be held responsible for shipping related issues once the package is received by the Post Office. Please contact the Post Office using your tracking # if you have questions about delivery. If your package is returned to me by the Post Office you will need to purchase a new shipping label. Double check your shipping address on Etsy and Paypal, make sure the address on your Etsy receipt is correct, this is what I will be using! Select to upgrade your shipping during checkout to include insurance. International customers please note: Adding this Priority fee will only add insurance to your package, it will not speed up your delivery. U.S. $2 for package value up to $100. International $4 for package value up to $100. Contact for custom quote if your order value is over $100. Claims will be paid out on a case-by-case scenario, as determined by the USPS. Photos of the product and packaging will be required. Contact me with questions after speaking with the USPS first. It's also a good idea to talk to your local Post Office to see if they are holding your package for any reason. First Class, 3-5 business days on average (longer during holiday rushes). Add $ for Priority, 2-3 business days on average. Add using this: https://www.etsy.com/listing/157798120 or upgrade your shipping option during checkout. Priority includes insurance. YOU MUST PURCHASE INSURANCE ON YOUR SHIPPING IN ORDER FOR THE POST OFFICE TO REIMBURSE YOU FOR LOST PACKAGES. Why is there a shipping fee on each additional item? Check your mailing address between Etsy and Paypal to make sure they are updated and accurate. I will ship your purchase to the address listed on the ETSY invoice, unless otherwise requested. ***If your package is returned to me due to invalid/incorrect address, you will need to pay for shipping again to have me reship the package to you. If you would like me to write a little message & ship it as a gift, just let me know what to write & where to sent it. You can tell me during checkout, in a separate Conversation or through email. ★★ International customers are responsible for all Customs or Duties fees. All packages are marked automatically as 'merchandise'. I can't control delays that happen with shipping. Each country handles their mail differently, and shipping times will vary. Your Customs label may provide tracking data, but it may be incomplete; other countries are not required to scan the label. ★ Delivery times are *estimates* and can vary wildly, I have no control over your package's shipping time. International First Class shipping, delivery can take 2-4 weeks on average; the U.S. Post Office does not have legal authorization to contact your country regarding First Class International packages. $50+ Priority Express shipping + Tracking #, 3-5 business days on average, Contact me for actual quote; This is THE ONLY service that will include Claims and Official tracking data. ★ Express shipping will be required on any purchase of $100+ for International orders. Your positive feedback really makes my heart smile, thank you! Your personal images of your custom order are always welcomed as well. REVIEWS: To receive 5 stars is my goal! Please remember that you are rating me, my service and the accuracy of your order. For example if the 18" chain is 'shorter than expected' or the Mini 1/2" Disc is 'smaller than expected' please don't let that reflect poorly on Tipsy Whimsey with lower star ratings. Please contact me first with questions if you're unsure about something with your order. Please email or Etsy Convo me if you have questions. Please DO NOT reply to me using the email address you see on your Paypal receipt. All of my jewelry contains small parts and may not be suitable for young children. Wear responsibly and with adult supervision! What does "hand stamped" mean? A hand stamped item means the metal charm has been struck by a metal tool (or die), typically with a hammer on an anvil, to create an imprint (or engraving) in the metal, which is then antiqued to show off its detail. Stamping metal by hand is an acquired skill that requires a lot of practice! Every letter, number and symbol is stamped one at a time, on every tag. Some tools require multiple hammer strikes to create a clean and deep impression in the metal. To date it is safe to say that Ann, owner of Tipsy Whimsey, has stamped over one million characters. Every stamped charm will be unique, the alignment can vary, no two tags will be identical. This adds to the handmade nature of your special order. Tipsy Whimsey is able to complete most orders within 2-4 business days. First Class shipping after this can take 3-5 business days in the U.S. A safe estimate: it can take 7-10 days for you to receive your order after you purchase it, in the U.S.
International shipping may take up to 2 weeks to reach larger cities, or longer for more remote locations. To speed up your order significantly, upgrade your shipping option during checkout to include RUSH + PRIORITY. This means processing time is about 1 business day and shipping is about 2-3 business days, in the U.S.
A business day is a weekday (Monday-Friday), excluding weekends or any U.S. government holiday. Where can I see the Fonts and Symbols available? You can search "All Fonts" or "All Symbols" or "All Hearts" to quickly find photos in this shop. Be sure to page through all photos; you can also read the symbol names in a list in the description. Can I add stamping to the back of the charm? Most of Tipsy Whimsey's plated charms can be stamped on the backside since they are nice & thick. There will be an additional stamping fee per added word, name, date or symbol. *When in doubt please contact me via the Etsy listing & include all text for your order. If you are ordering a charm to add to your own keychain please tell Tipsy Whimsey during your checkout notes so that stronger stainless steel jump rings may be used. All ball chains (except stainless steel) can be cut to specific length at home using good, household scissors. You can also request a custom length during your checkout notes (any length up to 24" is available). Dainty (1.5-2mm) ball chains come with a small tube closure. Thick (2.5mm) ball chains have a larger tube closure that is easier to grasp. Request a Thick ball chain during checkout if you or the gift recipient would prefer that size. You can upgrade any Dainty ball chain to include a lobster clasp. Search for 'upgrade' in Tipsy Whimsey's shop to find the link. PLEASE KEEP OUT OF WATER. Copper & Sterling Silver tarnish easily. Simply from the air, moisture, humidity, salt water air, skin's PH balance, lotion, perfume, oils on your hands, & chemicals in pools. Plated charms are plated with .999 fine silver, genuine copper or 24K gold. Plating is only one molecule thick so it can wear thin. Don't rub or wash your charms. Store jewelry & charms safely away from moisture in a jewelry box or bag. Avoid wearing it overnight & stay out of the water to preserve it as long as possible. Options to spruce up: Rub w/a polishing cloth (without cleaners). Dab rubbing alcohol on folded paper towel & swipe in little circles. Extremely fine steel wool (#0000) can be used but will leave fine scratches. If you need to open a jump ring in order to add your charm(s) to a bracelet or special chain, email Tipsy Whimsey to receive a quick tutorial image. Essentially, using two small needle-nosed pliers, grasp either side of the cut in the ring. You want to separate the ends of the little ring without misshaping the circle. Do this by holding one side still and push the other side forward / away from you - DO NOT pull them apart sideways (from left to right). When closing the jump ring, grasp again as you started, but work the end back towards you, in small push/pull movements.